Amit Rajat Gauri, a 41-year-old local businessman, had only heard about his family legacy until fate gave him a chance to claim it, at least a slice of it. Gauri, a descendant of Bhai Vasti Ram, a famous saint and spiritual guide of Maharaja Ranjit Singh, recently received two marble slabs from the saint's shrine located on the outskirts of Lahore. He gives credit to his Pakistani friend Waseem Altaf for reviving this linkage spanning over 200 years. 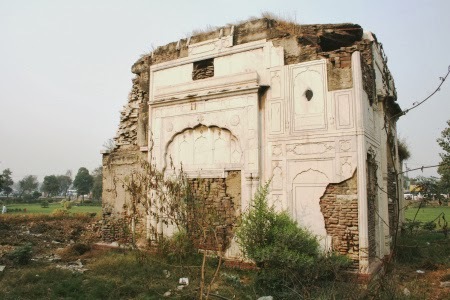 A recent decision by the Pakistan government to restore the shrine prompted Amit to contact his friend to help him reconnect to his ancestry. "When I heard that the Pakistan government has decided to restore the shrine and temple of Jhingar Shah Suthra near Lahore Fort, I asked Altaf, who is a celebrated blogger in Pakistan, to travel to the site. He went there and procured two marbles slabs from Bhai Vasti Ram's tomb and sent it across to me," Gauri said. "I feel indebted to my friend. The stones were lying dumped in the open. These might be pieces of slabs from a ruin for the world, but for us it's a family treasure," he said. "My grandfather Inder Singh, who was principal of Khalsa College, Amritsar, used to share stories of how the shrine came into existence. Maharaja Ranjit Singh, who was a devout follower of Bhai Vasti Ram, raised the samadh outside the Lahore Fort facing Minar-e-Pakistan,” he said. Bhai Vasti Ram was the son of Bhai Bulaka Singh who is said to have accompanied Guru Gobind Singh to the south in 1707. Bhai Vasti Ram settled in Lahore after that journey. He was the spiritual guide of Maharaja Ranjit Singh who had credited success in the Battle of Bhasin (1800) to his guidance. He died in 1802 at the age of 94.